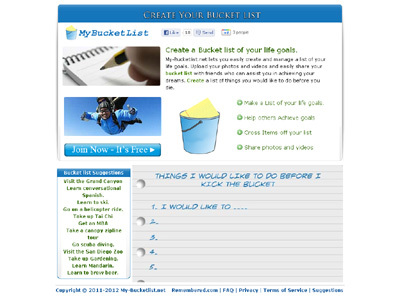 You can create your own list of life goals, invite your friends to participate, and help each other complete them. Receive coupons and special offers from vendors to help achieve your dreams. My Bucketlist uses social media to link you with friends who have similar goals (i.e. skydiving, learning to tango, visiting egypt) and then vendors can send you coupons to achieve those dreams.